A little less than a month ago, Apple held an education-focused event in which it announced the launch of iBooks 2, a move the company said it was making in an effort to “reinvent the textbook” by allowing users to purchase and download textbooks to their iPads. The new app enables the transformation of those expensive, heavy textbooks into lightweight interactive, digital textbooks, at $15 a pop. 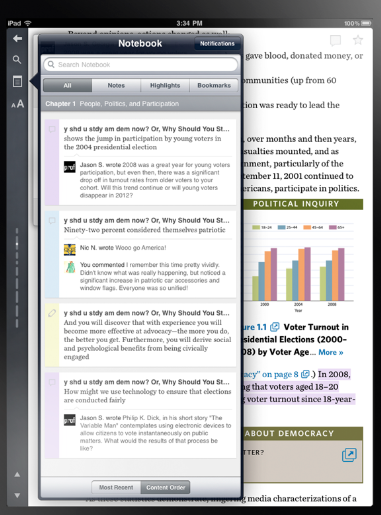 The accompanying iBooks Author allows teachers and amateur publishers to create interactive textbooks themselves. As Apple pointed out at the event, education has long been in its DNA. Steve Jobs himself had long wanted to disrupt the textbook industry, but the problem is that it’s hard to convince schools to adopt $500 Apple devices without a slew of affordable content to go along with it. The process of creating textbooks, from writing to editing to publishing is slow; it can take years for textbooks (and updates) to be approved by publishers. By enabling anyone to create their own textbooks, Apple attempted to cut the buearacracy at the knees; it may not be a perfect solution, but it was a savvy end-around maneuver to create a workable solution. In the end, the move certainly has the potential to upset the way textbooks are adopted. And, while some said that this was another example of Apple’s “Walled Garden,” it’s much more likely that Apple doesn’t actually care about whose content it’s serving, as long as it can sell more iPads. It doesn’t want to make or sell textbooks, it wants to create indispensable use-cases for its iPads. If anyone has insight into Apple’s educational efforts, it would be Inkling Co-founder and CEO, Matthew MacInnis, who was responsible for Apple’s expansion into educational markets in Asia and later a senior manager of all Apple’s international education efforts. In late 2009, MacInnis left Apple to co-found Inkling with the mission to help textbook publishers convert their content into digitized, interactive versions, going beyond static rehashing of text, thanks to the opportunities created by new, mobile means of consumption, like the iPad. MacInnis tells us that the team set out to build a publishing platform that would redefine digital media, starting with reinventing the textbook. But in doing so, they’ve discovered that to reinvent books, they’ve had to go back to ground zero and re-imagine the entire printing process itself. Desktop publishing has been around for decades, but to do it right, MacInnis said that they quickly became acutely aware that this required them to reset the type, so to speak. Adobe’s InDesign has long been the de facto standard for formatting and laying out publications, magazines, newspapers, textbooks, and so on. While the process that goes into producing publications and textbooks is innately collaborative, it remains a complicated, convoluted, and time consuming process. The author writes the manuscript, the illustrators create images separately, everything has to be scanned, upped to the server, whereupon it’s outsourced to India, aggregated into PDFs, sent back to publishers for a read-over, back to India for changes, and so on and so forth. A year later, they have a finished product. While iBooks looked to solve this problem, really the main use case for its Author tool is for teachers who want to publish books for their classrooms — those who aren’t looking to even sell it in the first place. In a sense, it’s like GarageBand or Keynote for quick textbook publishing, not so much a scalable model that works for the entire industry. At least this is the motivation behind the “software environment” Inkling is officially unveiling today, called Inkling Habitat. The startup’s new platform targets the other end of the spectrum from iBooks: Professional publishers, giving them an industrial, or enterprise, platform that includes everything they need to create and publish interactive content for both the iPad and HTML5-based web content. No desktop software, and no constraints of the printed page. 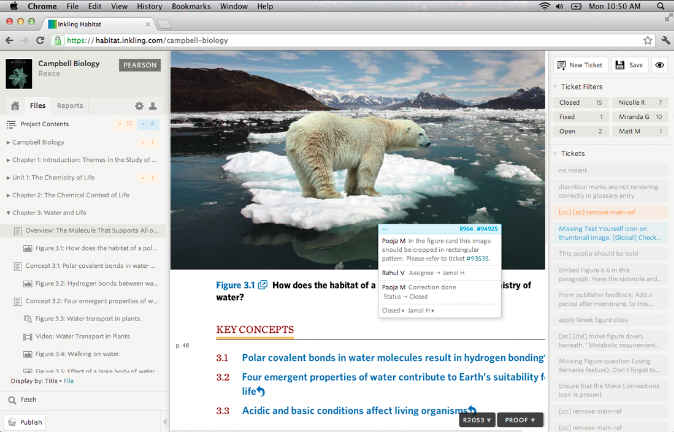 Inkling claims that Habitat is the “first integrated publishing environment” built for professional publishers. It allows publishers to push updates to every target platform once, while automatically customizing layouts for each device. Everything lives in the cloud, so that teams of editors, authors, and production partners can collaborate on textbook (or digital publishing) projects from around the world. Using the collaborative cloud, team members can see the same thing as their counterparts in India, staying in sync throughout the process. Habitat also boasts an object-oriented content structure, in other words, the platform is semantic, and “content is treated like software, shifting the industry from a page-based model to a software-based model.” Among the platform’s other features, Habitat includes automated error reporting, as it scans the content every time it’s published to make sure it all works, automatically finding broken links, missing files, etc. Habitat also automatically saves every version of the entire project, every time, from start to finish, which means that editors can rollback changes at any point during the process — all the way back to the beginning. This is huge. Inkling has, to date, published over 100 eTexts, and it is today announcing that two of the companies that have helped Inkling create these texts, Aptara and Innodata, will be expanding production on the startup’s platform. This means that, for example, Aptara will be extending its full-service “Design & Production Center” to all publishers, and its creative designers, media specialists, etc. will be working as an extension of publishers’ in-house teams — helping to increase the speed at which books are digitized. Inkling has raised upwards of $17 million to date, from investors like Sequoia, Kapor Capital, Sherpalo Ventures, and Felicis Ventures. Of course, when you consider the model that the startup is going for here, it begs the question of what effect this might have on Adobe, whose InDesign, as mentioned, plays a significant role in the publishing process. One could see InDesign and other Adobe products potentially being threatened were Habitat to achieve widescale adoption. When I asked Matt whether Inkling’s new system could take, say, PDFs or some other Adobe output and turn them into a digital textbook, his answer was yes — and no. Inkling does use PDFs of course, as they have all the text and images from a print title, however, the startup is increasingly using XML and original layout files (like InDesign) the publisher generate — that way the content is cleaner and has more structure. Video, molecules, and assessment feedback are integrated separately. Habitat then automates the management of these processes, through a fairly straightforward cloud-based interface, which I had the chance to demo a bit. It looks pretty slick. So, going from print-based content to media-rich, interactive content cannot be totally automated, humans remain an essential ingredient in the equation as well. Because so many publishers still use InDesign for their original layout files, and those need to be used by Inkling as the template by which to create the interactive version, it will likely be a slow disruption. Of course, in the big picture, as more and more publishers take up Habitat, it very definitely could eat into its user base. What’s more, Inkling says that its 3-D rendering engine can handle an order of magnitude of polygons more than Apple’s current offering, which enriches all of its content engines. No doubt this will be of interest to Apple. And, in terms of Inkling’s new web interface, all of this rich media is dynamically loaded on your browser, taking some of the burden off and adding speed to the rendering of its interactive content. Again, it’s way too early to say for sure whether this could be another nail in the coffin for Flash and spell trouble for InDesign. As to Apple, the CEO drew another Apples-to-Inklings comparison, saying iBooks is more akin to iMovie, whereas Inkling thinks Habitat is more like Final Cut Pro. Of course, together iBooks and Habitat together could be a great initial one, two punch for both amateur and professional publishers. Furthermore, should Inkling’s platform encourage a slew of big publishers to get on board (and the company already has partnerships with Pearson, McGraw-Hill and other bigs), it could end up being a boon for the adoption of iPads, which is why, in the end, Apple is keen on these kinds of solutions, MacInnis says. For more on Inkling, check them out at home here, and for more on Habitat, head over here.